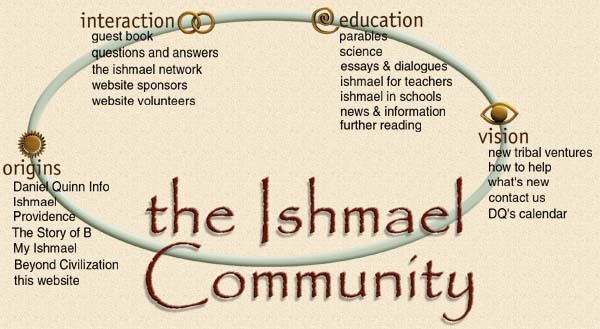 Farewell Daniel, Long Live Ishmael! Below is Daniel's official obituary, which is in the Houston Chronicle print edition today, March 18, 2018. It will be in their online edition forever, and can also be found for a year at the Neptune Society, where messages can be left. Until Facebook emerged, this website was the hub of activity for all of you who have been touched by Daniel's books. It still is, and always will be, the bedrock, the archive of all things that began with the appearance of that sometimes gruff and constantly probing telepathic gorilla a quarter of a century ago. Daniel and I have been constantly awed to see and hear about all the things that were being accomplished by you, his readers, as you found your own ways to share what you'd learned. I trust that this will continue through the years to come. Daniel Quinn, best known as the author of Ishmael, The Story of B, My Ishmael, and Providence, died of aspiration pneumonia on February 17, 2018 at Houston Hospice. He was 82. When they left Chicago for New Mexico in 1979, Daniel and Rennie Quinn never imagined they'd find a home in Madrid, a tiny former ghost town, or that they'd start a weekly newspaper that would serve a Rhode Island-sized territory east of Albuquerque and south of Santa Fe. They certainly never dreamed they'd spend 30 years in Texas–first in Austin and finally in Houston. It was here they discovered, in 1997, the newly-built loft in the Montrose District--their ideal kind of living and working space. It was like coming full circle, back to a city neighborhood akin to the one they'd left in Chicago when they set out on their westward journey. The substance of Daniel's education and career can be found at www.ishmael.org and Wikipedia. First and foremost, Daniel lived to write, and there can be no more fitting epitaph than this recent email from a reader: "Your books have forever changed me. Thank you." In addition to Rennie, his wife of 42 years and constant companion, Daniel is survived by his adult children: Teresa Mitchell (Michael), Stephen Quinn (Michele), and Jae Quinn; his younger brother, Ed (Darlene), and their children; granddaughters Jennifer Laurel and Kiera Hoffmann (Jr), and two toddler great-grandsons. He was preceded in death by his parents, Bert and Thelma Quinn, his older brother, Dennis, and his second-born daughter, Clare Kendall. Donations may be made in Daniel's memory to Cultural Survival or Survival International, two organizations devoted to the well-being of indigenous peoples around the world. Because space is limited and to help in planning, we need to know by May 15 how many people to expect. If you plan to attend please click here to RSVP. Use the News and Announcement form link to send me a note just saying "yes" and the number of people. Thanks for being loyal users of this website. We expect to be making some further updates in the months to come and will keep you posted. Here's a new mural just completed by Victor Palenque (@ishmael.lords), the artist who has created many Ishmael murals on walls throughout the Southeastern U.S. 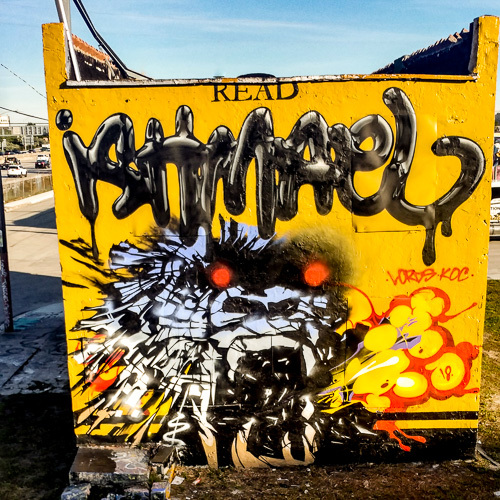 This was just finished along Interstate 95 in time for Art Week in Miami. Drivers will be able to see it on this wall for the entire year. Victor explained that the words Lords-KOC on the painting stand for Legends of Rare Design and Kings of Carolina, the names of painting crews or clubs.